One of my favorite past times is geocaching, and as a techie by trade I prefer to do my geocaching using my Android smartphone. The app I use for finding and logging my caches is C:GEO. That's all well and good, but how can someone use this information save their life? Well, the answer is actually pretty simple. Since geocaching uses GPS tracking satellites to pinpoint locations with latitude and longitude coordinates, you can use your smartphone and your geocaching app to find your way back to your vehicle or camp if you got lost out in the wilderness. That is, if you plan ahead a bit. A good scenario would be that you decided to go exploring a big forest near your camp that you've never been to before. Before you venture off you stop and record your camp's GPS coordinates using your geocaching app. To do that in C:GEO for instance, you can open up the app and go to Any Destination. 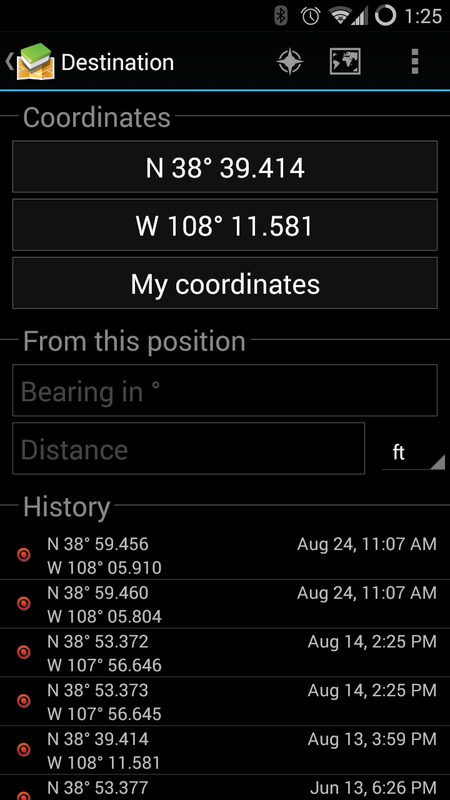 In there you can find your coordinates by pressing the My Coordinates button. You can then either write them down on some paper, or you can save them to your history in C:GEO by pressing the map button at the top of the screen. If you aren't planning on geocaching, and you aren't getting cell service where you are at then I'd recommend shutting your phone off to save the battery in case you need it. Now you are ready to wonder off into the woods! If you do get lost, you can now use your app and the coordinates of your camp to find your direction and get you safely back. Pretty simple right?